Yesterday’s parliamentary elections in Pakistan may go down in history as the first peaceful transition of political power in this country. 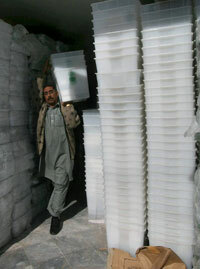 Although the country’s Election Commission has not yet released final results, the early returns point to a trouncing of President Pervez Musharraf’s party, the Pakistan Muslim League-Q, by the two leading opposition parties, the late Benazir Bhutto’s Pakistan’s People’s Party and Nawaz Sharif’s Pakistan Muslim League-N.
Pakistan faces several days and perhaps weeks of negotiations between the winners and losers in yesterday’s election over the formation of a new government—no matter what the final results of the election. But the initial results and observations of the voting at the polls yesterday point to a possible turn for the better in Pakistan. We came to Pakistan as part of an election observation delegation organized by Democracy International, which sent observers to Peshawar, Islamabad, Lahore, Multan, and Karachi. These efforts complemented the work done by Pakistani election monitors, including the Free and Fair Election Network, a coalition of Pakistani civil society organizations that fielded nearly 20,000 election monitors. We are all currently back in the Green Zone and doing fine. The pre-election environment was tense and uncertain. In our pre-election briefings with political and civil society leaders in the capital of Islamabad, many expressed worries about widespread violence and rigging by Musharraf’s government. We then deployed to different parts of the country: to Multan, a city in the southern part of Punjab province known for its Sufi shrines and agricultural lands, and to Islamabad, where the public holiday made the streets in Pakistan’s capital seem emptier than usual. Although we were in different parts of the country, we saw similar things. First, the presence of Pakistani police and security forces helped keep incidents of violence to a minimum. Security was tight for our delegation—teams had flak jackets and were accompanied by guards following in another car. In the parts of the country we visited, the authorities seemed to err on the side of caution, and their strong presence didn’t seem to intimidate voters to support one candidate versus another. The fears about terrorist attacks probably contributed to the modest voter turnout. In some parts of the country that had experienced the most violence, including the North Western Frontier Provinces, voter turnout seems to have hit record lows. Second, most of the administrative processes went well on Election Day. At each polling station, we saw a process that was largely well-organized and efficient. At each polling station, we took note of whether election stations opened on time, ballot boxes were sufficiently sealed, armed guards kept out of the polling stations, thumbs inked to deter voters from casting ballots more than once, and ballots counted properly. Because of problems with the voter registry, we both saw some voters turned away because they didn’t find their names on the registry. Some women faced special challenges, including efforts to prevent their voting. Other members of our delegation reported instances in which men tried to stop women from voting, but these problems do not appear to be widespread. For the most part, the mechanics and execution of this election, based on our individual observations in two different parts of Pakistan, seem to have gone fairly well—though it is too early to cast a final judgment until the final results and reports come in from the rest of Pakistan. The fact that the worst case scenarios did not occur on election day means that these elections could represent a chance to turn a new corner in Pakistan. Many analysts have interpreted the results as a repudiation of President Pervez Musharraf, and some have suggested that his time in power won’t last much longer. Yet it is too soon to predict how the dust will settle from yesterday’s elections here. There will be a lot of jockeying for power and negotiations between the different political factions. And there are many unresolved questions in Pakistan: Whether the independence of the judiciary will be restored, and whether the recent decline in terrorist attacks will continue. For the moment, though, Pakistan is breathing a sigh of relief. Many Pakistanis are looking anxiously ahead to the efforts to form a new government from the parties that came out on top in yesterday’s election.